Northeast innovation is steeped in world-changing advancements. American democracy? Forged in the Northeast. Your ability to read the Constitution on your phone whilst taking care of business? Bostonian Alexander Graham Bell laid that groundwork, while Buffalo's Willis Carrier invented the air conditioner to make you sweat less while doing it. Yet for all that generosity of spirit and invention, the NE seems to be hoarding its best snacks. Would not the world be a better place if we could all house a stack of whoopie pies or discover the joys of pizza egg rolls? These snacks have long remained staples of the NE. It's time they were everywhere. Who knows what greatness a world with sponge candies for all would bring? 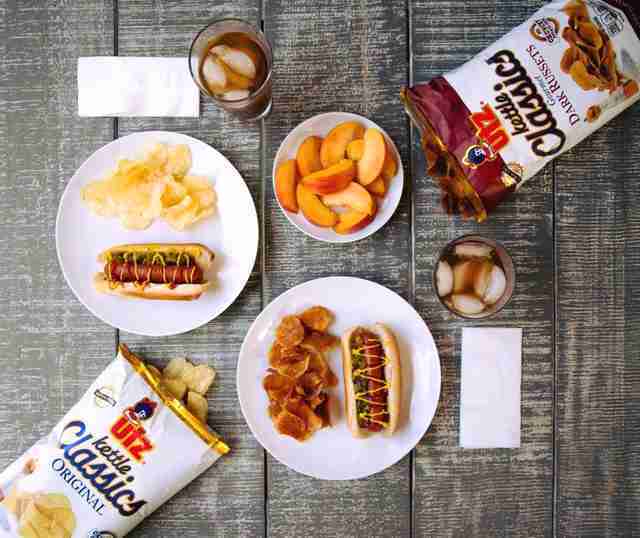 Why they're great: From the iconic Cheese Balls and super cheesy popcorn that turns your fingers orange to pork rinds, Pub Mix, and pretzels, Utz has been creating salty, savory, and sweet snacks since Sallie and Bill Utz started making the original chips in 1921. Even better? Most of them come in gigantic buckets. And while Utz sometimes turns up in other parts of the country (usually at Costco), they remain very much part of the fabric of the Northeast throughout grocery stores. Probably because they stained that fabric orange. Why they're great: Dubbed the “anytime cookie,” these soft cookies are covered with a thick hand-dipped layer of chocolatey fudge and probably angel tears. We owe it all to Henry Berger, a German man who came to the states in 1835 in search of new opportunities. 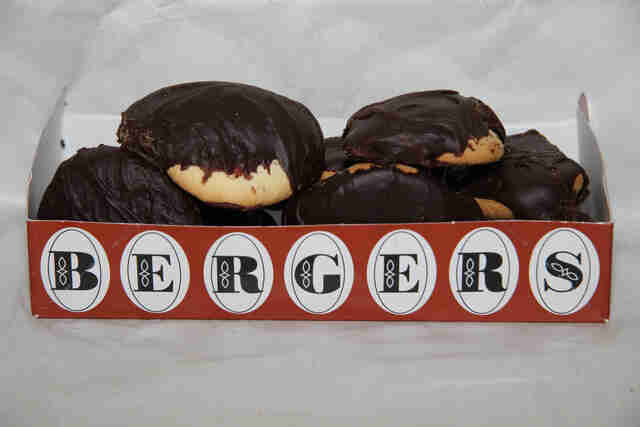 He opened a bakery in East Baltimore gracing the US with his treats that you can now get at the bakery, grocery stores, coffee shops, and convenience stores all over the state… or at the two bakeries in Delaware where Berger made good on that American Dream thing. Why it's great: The secret ingredient to this insanely addictive dip? Crushed up bison meat. It’s tangy. It’s juicy. And I’m totally lying to you. 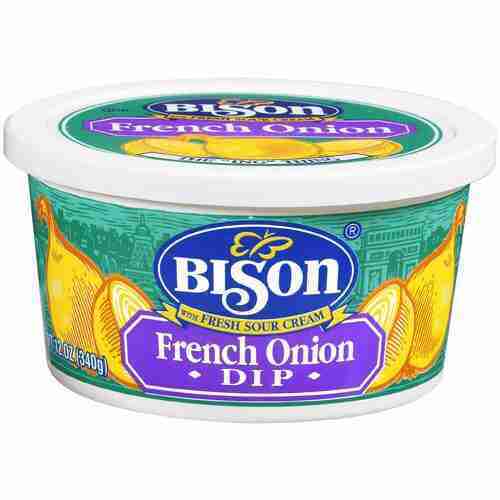 Since 1931, Bison Foods has been providing the absolute best meat-free dip that simply combines real, fresh sour cream with the right spices and ingredients to make a smooth, flavorful dip that needs to be at every Bills tailgate, cookout, and shindig lonely night with Netflix. It’s available at grocery stores in the area, which is convenient since you’ll need some potato chips or super salty pretzels to use as delivery vessels. Why they're great: Bob Cordova and Jason Cordova are the men -- nay, heroes -- behind Finger Food Products who decided they’d make it even easier for us to down pizza. How? 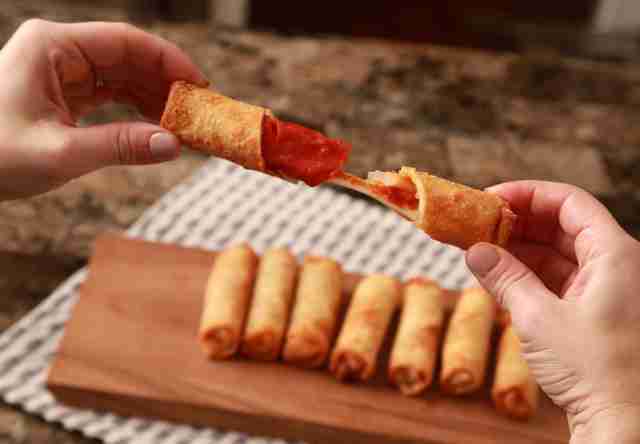 By rolling it the ingredients into a thin crusty shell and deep frying it into a sort of delicious, cheesy pizza eggroll that you can find in grocers' freezers throughout the region. Now you can eat pizza with just two fingers instead of a whole hand. What a great time to be alive! Why they're great: Wegmans is a grocery store that has a massive cult following due to its amazing customer service (No, seriously, everybody's happy in there… it's super weird) and insanely delicious store-only snacks. 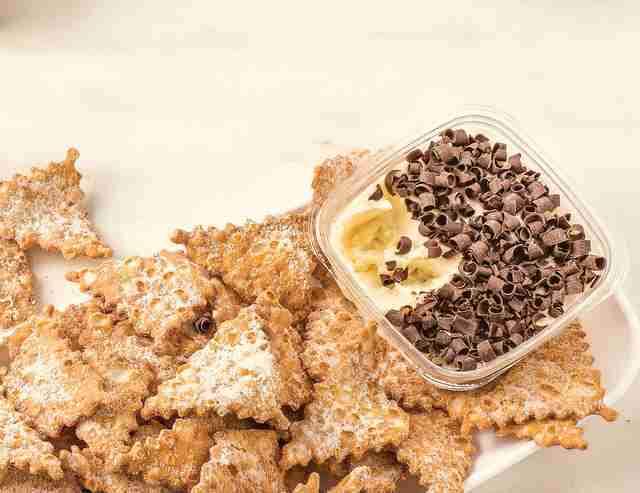 And while the Buffalo Wing Cheddar Spread is a standout, nothing quite beats the Cannoli Chips. Basically, it's a dessert version of nachos, but instead of a cup of cheese you have cannoli filling, and instead of tortillas you have hunks of pastry. In a fancier place, they might call it deconstructed cannoli. At Wegmans, it's just a perfect snack. Why they're great: They're kind of like cough drops. But instead of intense menthol and bad breath they're ultra-sweet, melt in your mouth, and slowly inch you toward diabetes. 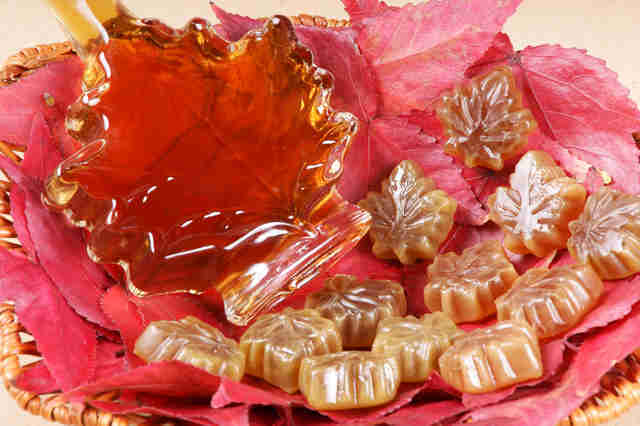 They can be found in sugar shacks, country stores, and basically anywhere that looks cozy in maple syrup country. Why they're great: Cold pizza for breakfast is a classic hangover food, but cheeseless cold pizza? In Rhode Island, all the locals really need is a good crust and fresh sauce. Like any delicious pizza, it all begins with a solid foundation. 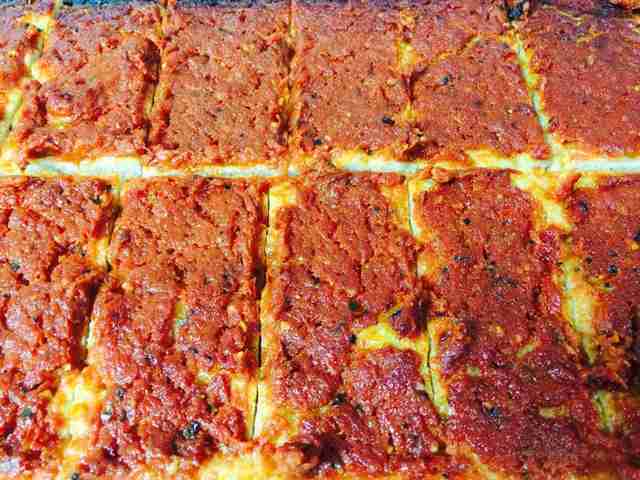 A rectangular, hearty slab of focaccia bread is coated with spicy tomato sauce and generally served at room temp to create the masterpiece that is the pizza strip, available in restaurants and bakeries throughout the state. 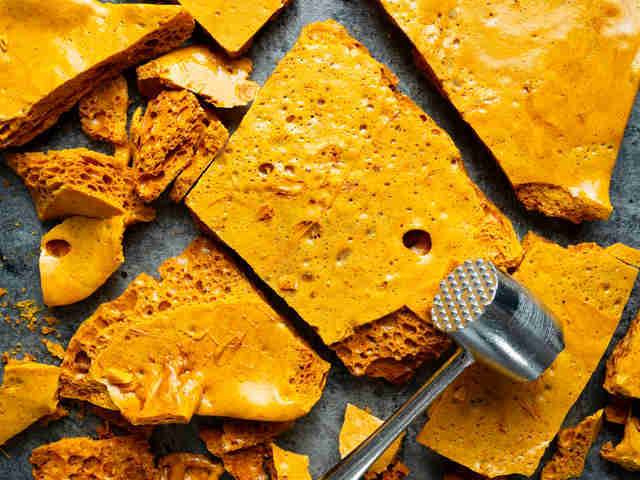 Why it's great: Sponge candy is the super crunchy, honeycomb treat with sweet flavors like caramelized sugar and molasses that you need to have in your mouth, like, yesterday. Think of the crunch you get from a Whopper candy, but lighter and airier with a rich toffee flavor. The candies have created a local obsession that has seen them show up in various flavors and even in a beer at Resurgence Brewery, which is basically the Buffalo equivalent of Skittlebrau. Why it's great: In 1963, Long Islander Elias Betzios created the business that would fill toaster ovens throughout New York with pizza covered in tangy sauce. 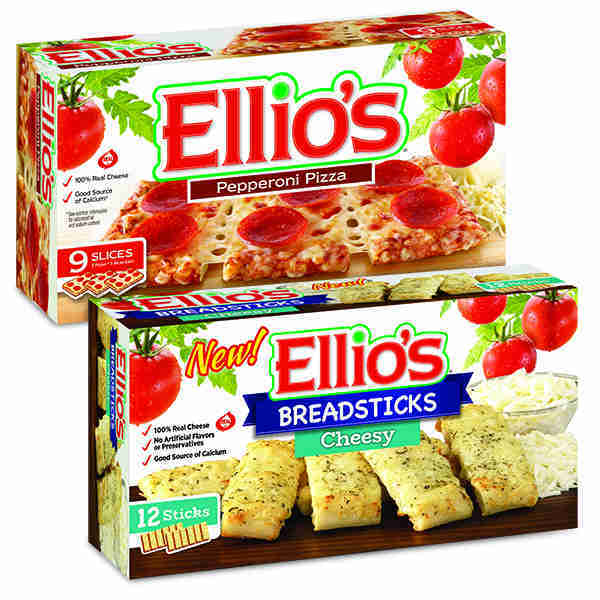 A few generations of latchkey kids later, Ellio’s has a dedicated cult following of people who become extremely disappointed to discover that the pizza becomes increasingly rare the closer you get to the Mississippi. These sweet-sauced, snack-sized pizza rectangles are a go-to drunchie for nostalgic east coasters and a point of coconfusion of transplants who grew up on Hot Pockets. 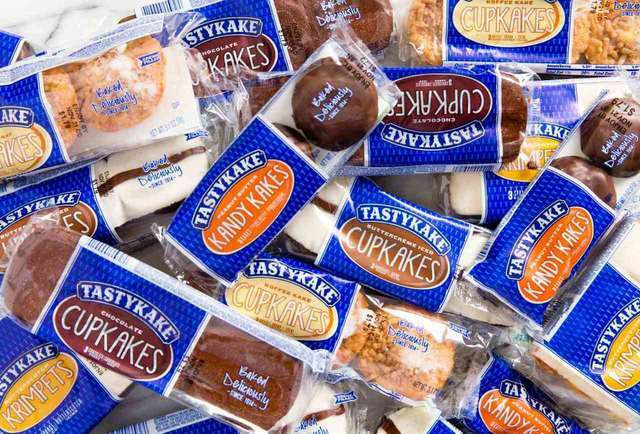 Why they're great: Founded by Philip Baur in 1914, Tastykakes was created to deliver individually wrapped honey buns, danishes, snowballs, cupcakes and more to the area, and for that we’re thankful. Their cakes are known for being fluffy and creamy, incorporating plenty of tasty ingredients like coconut, butterscotch icing, chocolate, and jellies. Their Krimpets, a sponge cake filled with cream, along with their other delicious desserts are extremely ubiquitous throughout the region, and if you're a transplant, rejoice: while certain varieties remain east coast-exclusive, Tastykakes are showing up in more and more markets (and Jersey Mike's locations) nationwide. Why they're great: Old Bay isn’t just for crabs and your bloody Caesars. 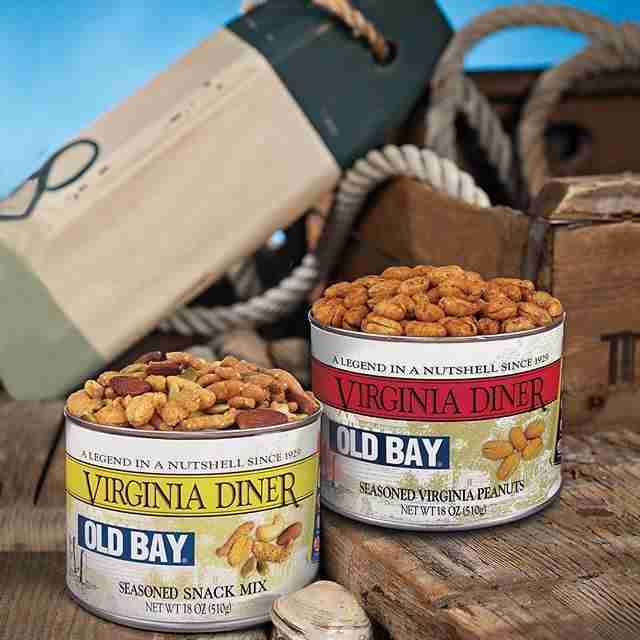 Although the Virginia Diner is an actual diner where you can buy these Old Bay-seasoned nuts nuts, they’re also available in various grocery stores in the area. They're generously seasoned with the famous seafood spice, Old Bay, along with flavorful celery salt, mustard powder, and smoky paprika. Why they're great: Johnnycakes are the Northeast equivalent of a tortilla that tastes like it’s blended with a fluffy pancake. A simplistic version of the flavorful cornmeal flatbread is made with nothing but hot water, cornmeal, and salt, creating a thin savory batter. 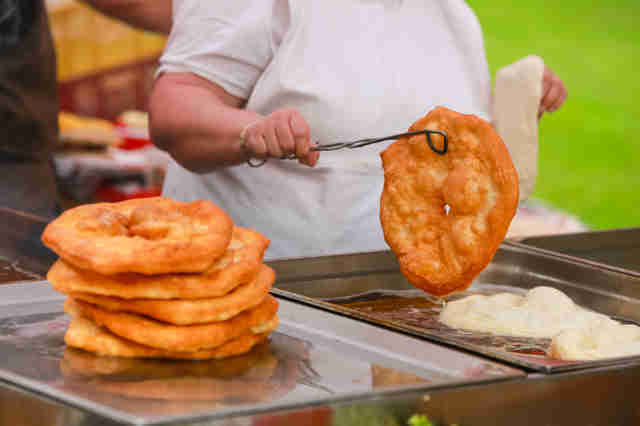 Locals jazz it up for breakfast with sweet toppings like syrup and butter or snack on them just as they are. Some Rhode Islanders believe that the original name was actually "Shawnee cake," named after the tribe that once grew corn on the land, and it was screwed up in passing like a bad game of telephone. 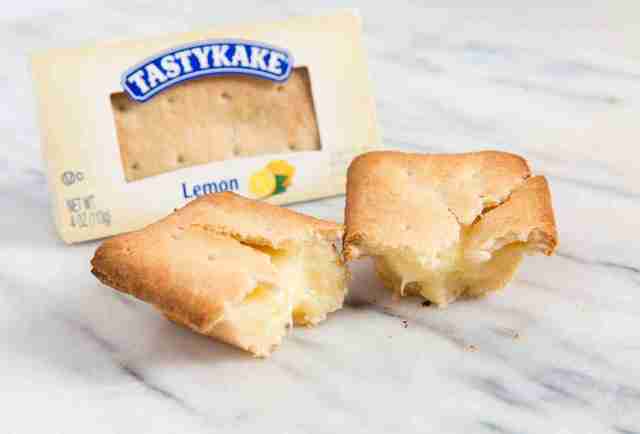 Jessica Kelly is a freelance food and travel writer that’s really wishing she had Tastykakes stuffed with pizza strips and topped with sponge candy for the ultimate snack inception. Watch her snack on foods in Buffalo and beyond on Instagram @Adventures.Are.Waiting!